LexisNexis designated the Reinisch Wilson Weier PC “Workers’ Compensation Defense Blog” as a “Blog to Watch” in its annual review of workers’ compensation and workplace issues-related blogs across the United States. Over 200 blog sites were reviewed; 22 were selected as either “Blogs to Watch,” “National Blogs,” “State-Specific Blogs” or “Niche Blogs.” Read more here. 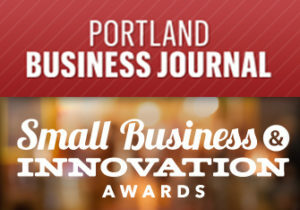 Reinisch Wilson Weier PC was honored at the Portland Business Journal’s Small Business and Innovation Awards event held November 5, 2015. The firm was recognized as an honoree in the 51-100 employee category. Read more here. 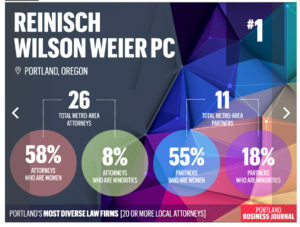 With its 2018 submission of minority and women attorney data to the Portland Business Journal, Reinisch Wilson Weier PC was ranked number one as the most diverse Portland metro-area firm among large law firms (20 or more attorneys) in the Journal’s February 3, 2018 issue. Read more here. 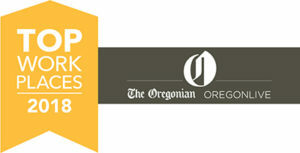 Reinisch Wilson Weier PC was been named a Top Workplace in 2018 by the Oregonian/Oregon Live in its September 30, 2018 issue. The Firm is one of 100 companies in Oregon and Southwest Washington to be recognized and was ranked 15th out of 45 small companies with less than 100 employees. Read more here.